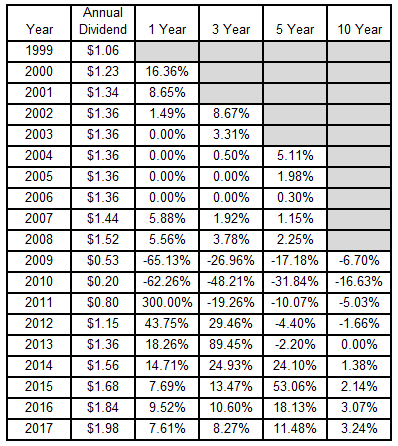 Something I love about dividend growth investing is that each month I get to hear about companies I own deciding to pay me more money in dividends. Just for owning a small portion of said companies. Not going and doing R&D for new products or technology. Not selling any products. Not managing any employees or inventory. Not making sales calls. All I had to do was have the foresight to invest some of my savings in excellent companies. That's dividend growth investing at work! I mean who doesn't like getting a raise for doing nothing? Dividend growth investing is far from a get rich quick investment strategy, rather you need to remain focused on the long term goal to be successful.Yesterday the Board of Directors at JP Morgan Chase (JPM) approved another increase to their quarterly dividend. The dividend was increased from $0.48 to $0.50. That's a 4.2% increase to their dividend payment. 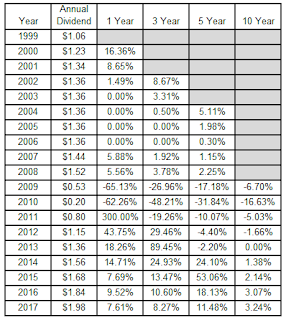 Assuming the dividend is maintained at this level fro the remainder of 2017, this year will be 7 consecutive years of dividend growth for JP Morgan giving them the title of Dividend Challenger. Shares currently yield 2.29% based on the new dividend payout.